What Is the Difference Between Gray Echo Chainsaws & Red-Orange Echo Chainsaws? Echo chainsaws are well known for both power and long lasting durability and are used by both professionals and amateur woodcutters or landscapers. Currently, Echo produces only the red-orange version of its chainsaws. However, in the past the company produced only a gray version or both the grey and the red-orange. This has led many people to question the difference between these saws. Echo chainsaws are a popular brand known for power and durability. In many cases, consumers mistakenly believe that the gray or white version of the echo chainsaw is consumer grade while the red-orange version is professional grade. This myth is not true as all. Echo chainsaws are all the same grade. The gray Echo chainsaws were manufactured in different sizes, with different sized motors. These chainsaws range from a small, 300cc engine to a large 700cc engine that can greatly affect the power, weight and cutting ability of the saw. These motor size options can be found in both the red-orange and the gray versions that may still be on the market. Different blade sizing can also account for the differences between the gray and the red-orange Echo chainsaws. In many cases, the older chainsaws used bigger, heavier blades. 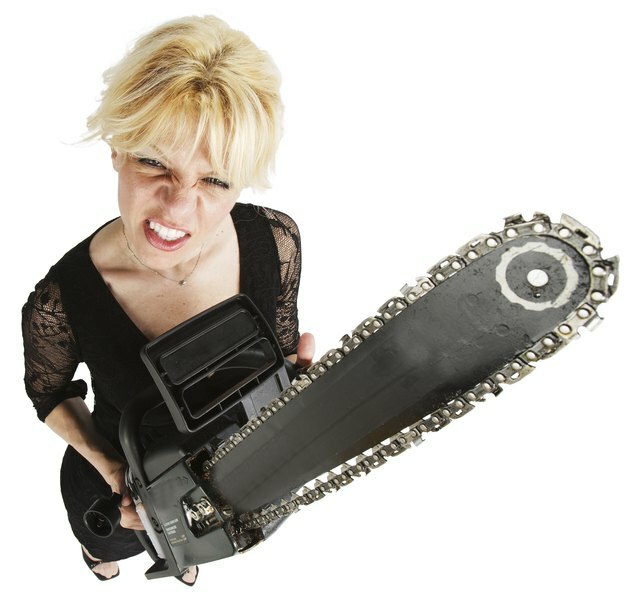 Therefore, a gray chainsaw blade is likely to be bigger and to require a longer chain. Common sizing ranges from 12 to 24 inches and should be chosen depending on the level of use and what it will be used to cut. For example, a 12-inch blade is useful for light clearing of brush, while a 24-inch blade is more useful for heavy log cutting or lumbering. Certain models of Echo chainsaws came with additional features such as chain safety equipment. Other differences included what the saw was intended to do such as ground cutting, trimming, bush removal, logging or above ground cutting. Most of these models were produced in both saw colors. However, if saws are purchased in separate colors, the colors can be used to differentiate the features. Any other differences between gray and red-orange chainsaws can usually be attributed to age or year of make and model. These design differences can usually be spotted by difference in body model or chain design. Simon Slayford is an education professional who wanted to try something different. He has been a writer for over eight years and has been published in local writing magazines such as "The New Zealand Listener." Slayford holds a master's degree in language studies and early literacy from University of Otago.